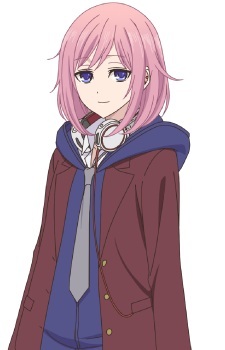 Matsuri is a second-year in middle school and Yuzu's childhood friend who lived close to her before she moved to the Aihara residence. Matsuri makes her first appearance in chapter 6. She is a pretty girl who is always seen with a pair of headphones around her neck. being very sly and fake toward an unidentified friend. She comes across Yuzu and Harumin at an arcade and invites them out to karaoke. Harumin is appears to be quite wary and suspicious of her. Upon deducing the nature of Yuzu's feelings toward Mei, Matsuri professes a romantic interest in Yuzu and kisses her in front of Mei. She sells masturbation videos she finds on the Internet to old men through a phone app, and tells them they are hers, as a means of income. She considers men to be dense and believes that all can be manipulated easily. As of Chapter 10, when on a "date" with Yuzu in a shopping centre, she tells Yuzu in front of a crowd that she loves her, and it is heavily implied that it is romantic in nature, but her feelings were not answered due to Yuzu being in love with Mei. Annoyed with her "date" being interrupted by Mei, Matsuri meets up with Mei later and tricks her into kissing her (though she expected Mei to hit her) and has two delinquents take a picture of the kiss, which is implied to be used as blackmail in the future.